Laura Intravia is a combination of performer, composer and arranger. She is a graduate of Ithaca College with degrees in Composition and Vocal Performance and is internationally renowned for her multi-faceted musical career. Laura’s original concert works have won several awards, including 2nd place in the 2008 New York Treble Singers Composition Competition and the Jack Downey Vocal Composition Prize. She is also an active arranger; her piano arrangements of Austin Wintory’s award-winning score to Journey were published by Alfred Music in 2013. 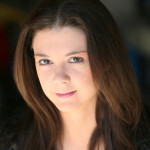 Her orchestration experience and attention to detail are widely recognized by her colleagues, as she is frequently hired to arrange, orchestrate, proofread and copy music by composers and studios such as Christopher Tin, Austin Wintory, Wataru Hokoyama, Collective Muse Media and the Video Games Live concert series and albums. She appeared on VGL: Levels 3 and 4 as an arranger/orchestrator, and in 2015 released her first piano arrangement album Through Time and Space.. She was nominated for her first G.A.N.G. award for Best Game Music Cover/Remix in 2015, for her cover single of “You Were There” from Ico. Laura’s varied vocal and instrumental skills have been featured both onstage and in the studio. She has performed as a vocal and instrumental soloist with the international concert tour Video Games Live since 2009, in addition to appearing as a guest vocalist with Pokemon: Symphonic Evolutions since 2014. In addition to performing on three VGL albums, she has also recorded for several video game and film soundtracks, working remotely from her home studio in Boston. Her versatility and broad scope of her musicianship, combined with her team-player work ethic, have made her an in-demand collaborator for independent projects, AAA titles, and everything in between.